Ah, mastery… what a profoundly satisfying feeling when one finally gets on top of a new set of skills… and then sees the light under the new door those skills can open. Ideal for interviews, green screen work, photography, and anything that doesn’t require a lot of floor space. Available pre-lighted for basic green screen usage. Studio B is available as a standalone rental or may be upgraded with equipment packages, crew support, catering, production management, or any combination thereof. The bottom line: we’re here to support your project in whatever capacity you choose. 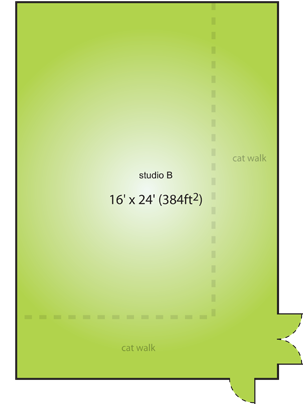 Click here to access our Studio Request EstimateForm.